Yesterday we enjoyed a sunny trip to see my mum at Southport, which included a stroll up the pier and a play on the old penny arcade at the end. 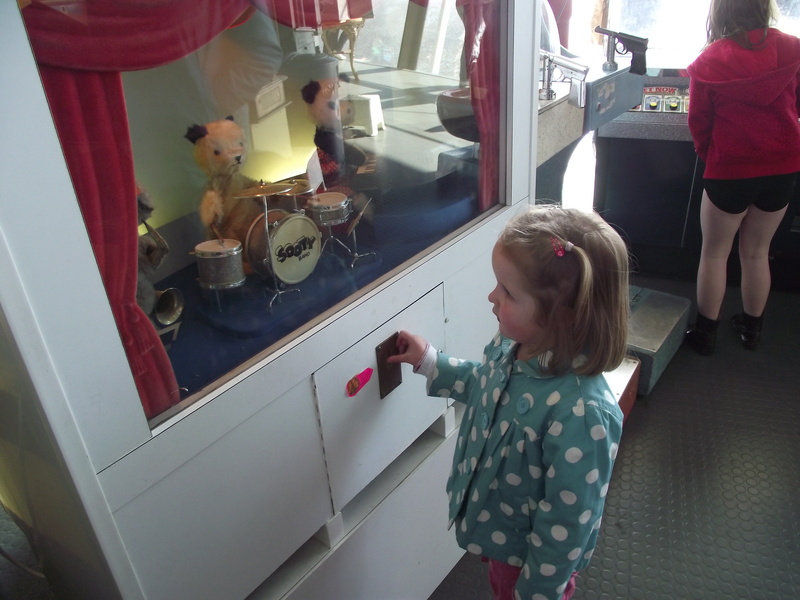 The arcade has lots of old ‘penny in the slot’ machines, which take old pennies, and Lilly’s absolute favourite is the Sooty and Sweep Band – you put your penny in and Sooty, Sweep and Sue play their instruments and sing a different nursery rhyme each time. A year ago it was her favourite and she listened to about five songs, fascinated at first and then eventually dancing along. It was exactly the same story yesterday, even with 12 extra months maturity under her belt! But then again, would Sooty and Sweep seem outdated to Lilly alongside Rastamouse and Peppa Pig? Some of Lilly’s favourite TV programmes and characters are ones that were around when I was little – Thomas the Tank Engine, Fireman Sam – but she doesn’t like watching the “old” versions – you know, the ones with the actual models whose mouths dont move – she refuses to watch these old episodes and only likes the computer generated super flashy versions – and who can really blame her? So then I got thinking about the children’s programmes Lilly and Isla’s children will watch. Will they still be enjoying Thomas the Tank Engine and Fireman Sam? And which of today’s CBeebies programmes will become classics that Lilly and Isla will watch with their children? And how will they be modernised to attract a new generation? Tony thinks Peppa Pig will be an enduring classic. But how will it change? Peppa in 3D? Smellyvision? Peppa flies a spaceship? How about the others? Waybuloo – that would work well in 3D! But I think, like Teletubbies, it will have its day and then fade.